other GORGEOUS artwork at CDO. 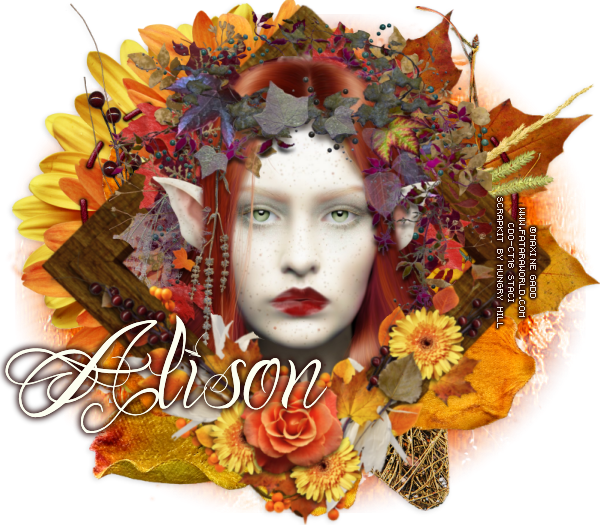 The Scrap Kit I am using is called Autumn Days by Tammy Kat Dezigns (OMG Tammy! This kit is too cute! Thank You!) You can purchase this and other WONDERFUL Scrap Kits at CDO. Font used is a FTU font called Foglihten No 07. Open a Transparent New Image 800X700. Open tk-autumndays-frame2 and copy and paste as a New Layer. to the left a bit to center it on the round frame. Blur 3.00 and hit OK.
the left hand side of the frame. the left hand side and moved down to just above the leaf cluster. down to above the fleur de lis. just below the tube layer and to the lower right hand side of the heart frame. of the tag below the paper flower. paste as a New Layer. Layer. Should be above the orange spatter. branch layer and hit the Delete key once on your keyboard. Selections Select None. it so it looks like the clip is holding it. I like my tags at 600 so I resized all layers to 600X525. purchase this and other BEAUTIFUL artwork at CDO. Scrapkit used is a STUNNING kit by Hungry Hill called Blaze(OMG Alison! Such a great kit! Filter used is Mask 42 MB and SW by Moonbeams and Spiderwebs. Font used is a FTU font called One Chance. Open an 800X700 Transparent New Image. to find your mask, click on it and hit OK. Layers Merge Merge Group. Open frame-3, Image Resize 550X542 and copy and paste as a New Layer. Image Rotate, Free Rotate Left Free 45 and hit OK.
of the frame and down to just above the mask layer. Add a dropshadow. hand side of the tag and below the berries layer. Add a dropshadow. layer and to the left a touch. Add a dropshadow. that is poking out on the left hand side. stem on the left hand side of tag. tag. Move below the heart-stitches layer. Add a dropshadow. under so just erase it. move down to just above the mask layer. Add a dropshadow. I then Resized the tag to 600X525. purchase this and other BEAUTIFUL artwork by Maxine and other Artists at CDO. Shadow, Willy Tablet Lines Tramages TeeWee and Xero Bad Dream. Open an 851X315 transparent new image. Percentage 20 and hit OK. Do the same again but change the direction Right. Do Upwards and Downwards too. at 41 and click the lighter circle and hit OK.
Change your blend mode to Overlay. at 128 and everything else at 0. Add a dropshadow.